The number of illegal guns recovered by April eclipsed the unit’s entire 42-gun haul for all of 2016. The number is just a portion of the total number of illegal weapons police removed from District streets. Chief Peter Newsham said the rise in the number of guns recovered stems from an effort to crack down on drug dealers, which has led officers to the illegal firearms the dealers carry. “You look at where we are having violence and you look for the drug sales in those particular areas, and you can see as we’ve changed our focus to those distributors who are contributing to the violence … I think this focus is really having an impact,” Newsham said. 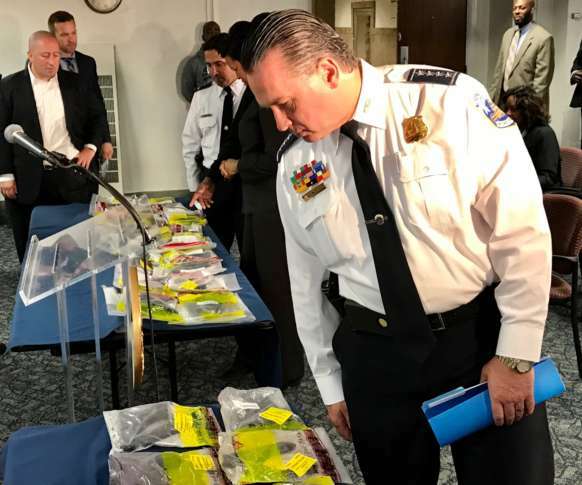 Formed nearly two years ago, the Narcotics Enforcement Unit’s plainclothes officers hone in on dealers, the majority of whom, Newsham said, obtain their guns from Virginia. “There doesn’t appear to be one group that’s bringing guns in large numbers. People are going out into Virginia, making straw purchases and bringing the weapons back to the District,” he said. Newsham referenced a meeting he had earlier this week with the Bureau of Alcohol Tobacco and Firearms leadership regarding guns in the District. He said the leading source of those firearms is Virginia, followed by Maryland. “The team has also seized large amounts of narcotics including synthetics, cocaine, heroin, PCP and methamphetamine. Identifying crime patterns and removing dangerous offenders and weapons are key to how we will drive down all violent crime, homicides and assaults with guns,” Bowser said of the police department’s strategy. The enforcement unit was formed to replace what were known as vice squads — teams of plainclothes officers who targeted street corner drug buyers and whose tactics led to tension between residents and police. Newsham said the officers in the new enforcement unit were “hand selected and received more training” with the goal of providing a more professional unit to target drug distribution, not users.